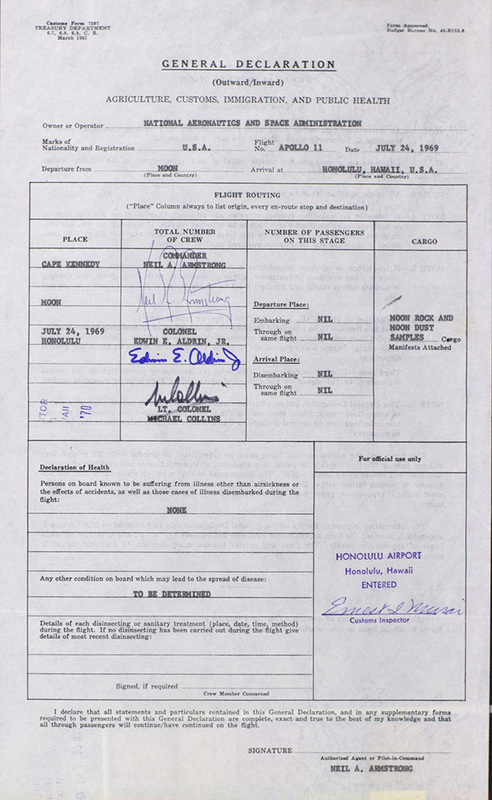 The U.S. Customs declaration form filled out by the crew of the Apollo 11 lunar mission upon their return to U.S. soil at Honolulu Airport on July 24, 1969. The only royal palace to be found in the U.S. 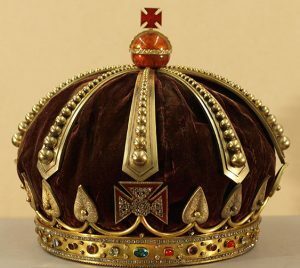 The dirt road that runs in front of the palace gates is known as King Street. 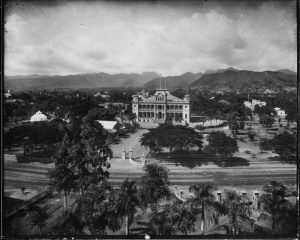 The Hawaii State Archives would be built off to the palace’s left in 1906. The white domed structure seen on the left of this image was originally known as King Kalakaua’s coronation pavilion. Commonly known as the ʻIolani Bandstand. 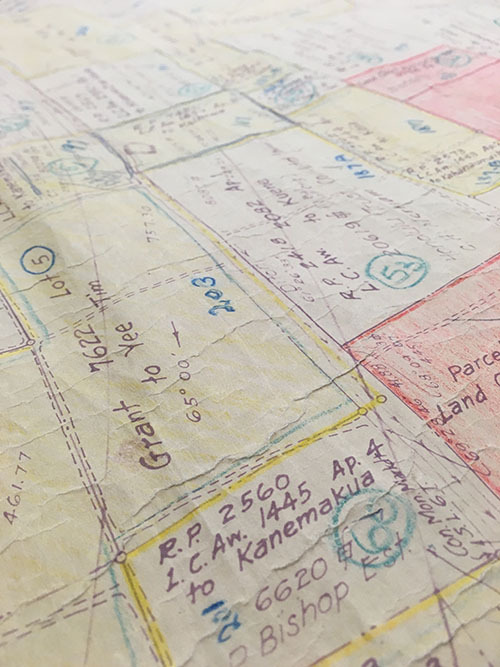 Map of land ownership mauka (north) of Ala Wai Canal in Waikiki, date unknown. 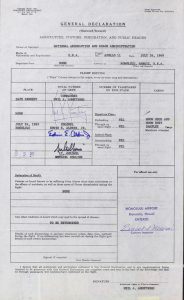 Shows Land Commission Award, Land Court Application and grant information, including names, numbers, square footages. Portion of a larger map, 2 sheets glued together. 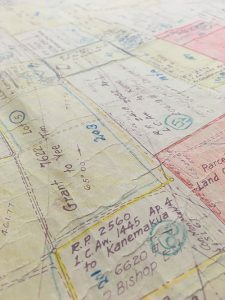 Land Commission Award No. 1, awarded to John Voss and Land Commission Award No. 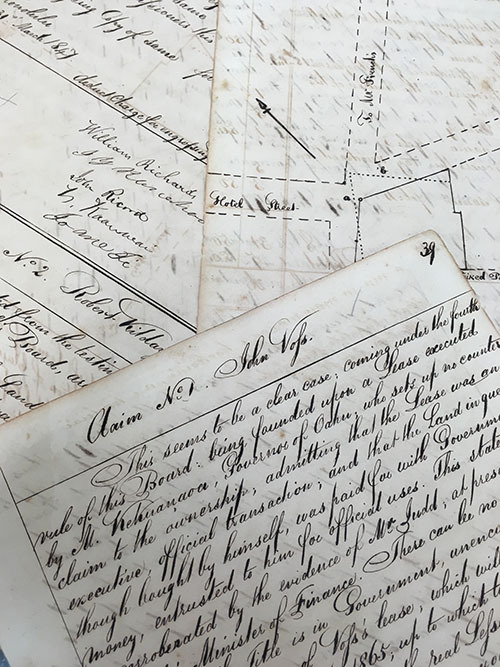 2, awarded to Robert Wilday by the Board of Commissioners to Quiet Land Titles in 1846. 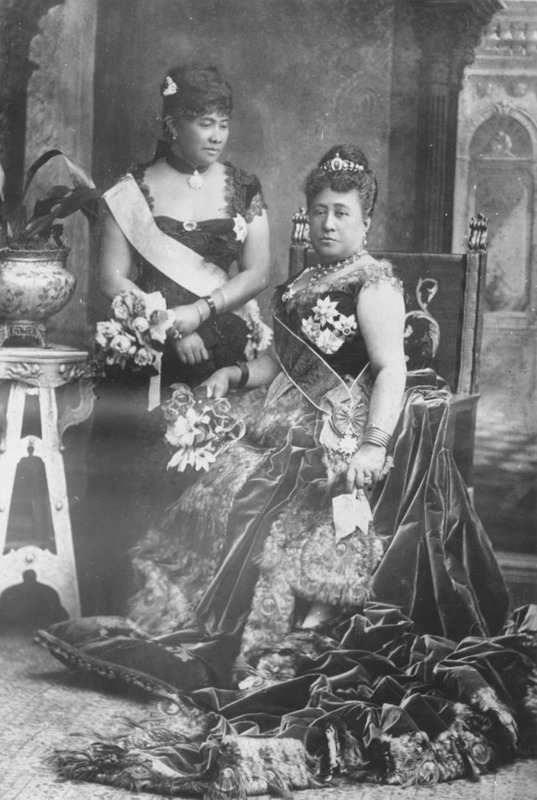 Queen Kapiolani, on the right wearing the peacock gown, and Princess Liliuokalani, on the left, attending Queen Victoria’s Golden Jubilee in 1887. Currently on loan to the ʻIolani Palace, on display in the throne room. 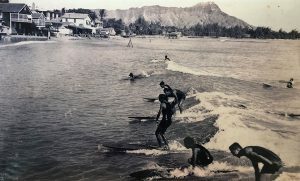 Shows surfers in Waikiki with Diamond Head in the background. 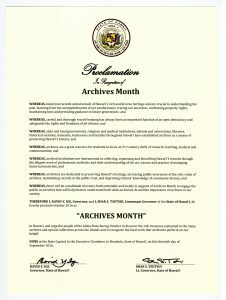 Governor Ige proclaims October 10, 2016, otherwise know as 1010, as Electronic Records Day in Hawaii and asks all the people of the land to join him in recognizing the vital importance of electronic records in understanding and sharing the history of our state and to acknowledge the role that the Office of Enterprise Technology Services, Hawai‘i State Archives, and other agencies and institutions play in promoting less paper-dependent processes as part of an effective, efficient and open state government. 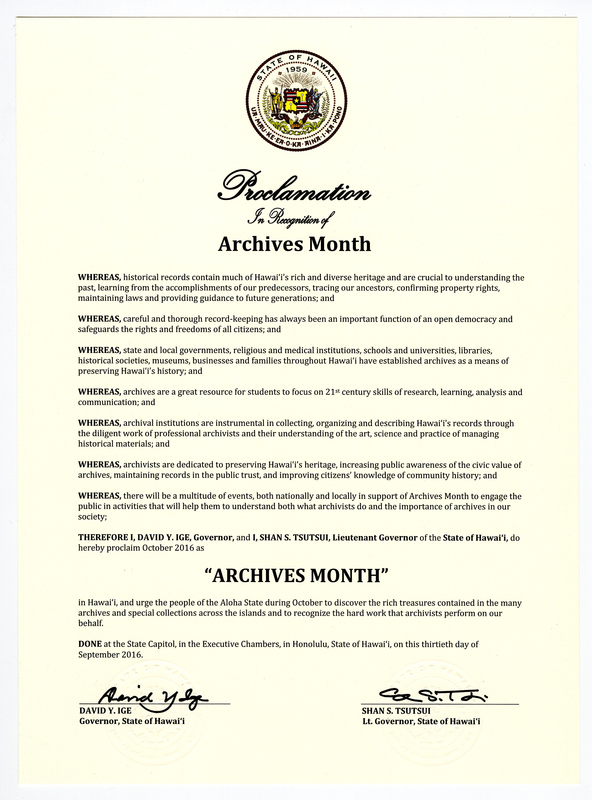 The Hawaiʻi State Archives is celebrating 110 years of serving the public and preserving government records. 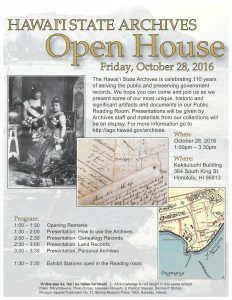 We hope you can come and join us as we present some of our most unique, historic and significant artifacts and documents in our Public Reading Room. 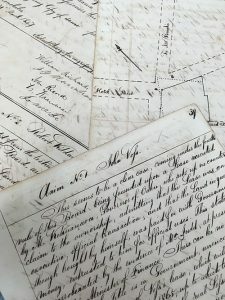 Presentations will be given by Archives staff and materials from our collections will be on display. 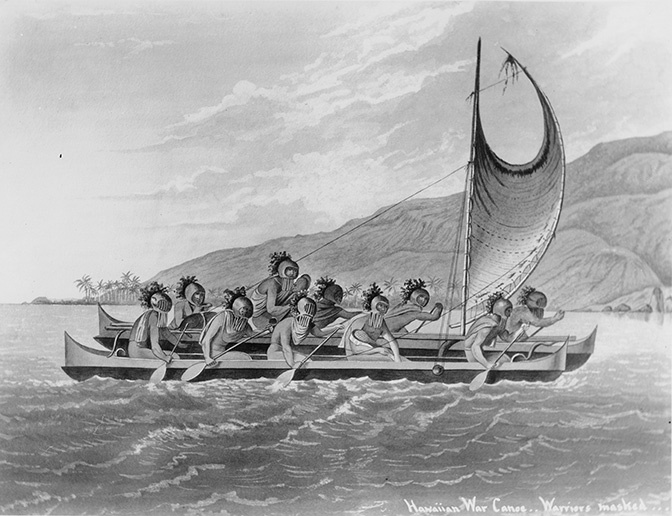 Pukui, Mary Kawena. 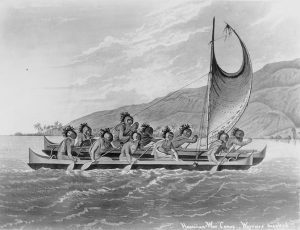 ‘Ōlelo No‘eau: Hawaiian Proverbs & Poetical Sayings. 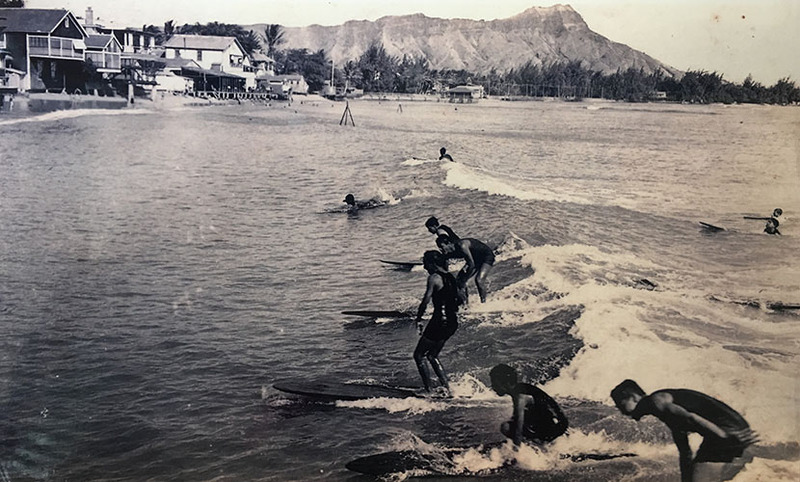 Bernice P. Bishop Museum Special Publication No. 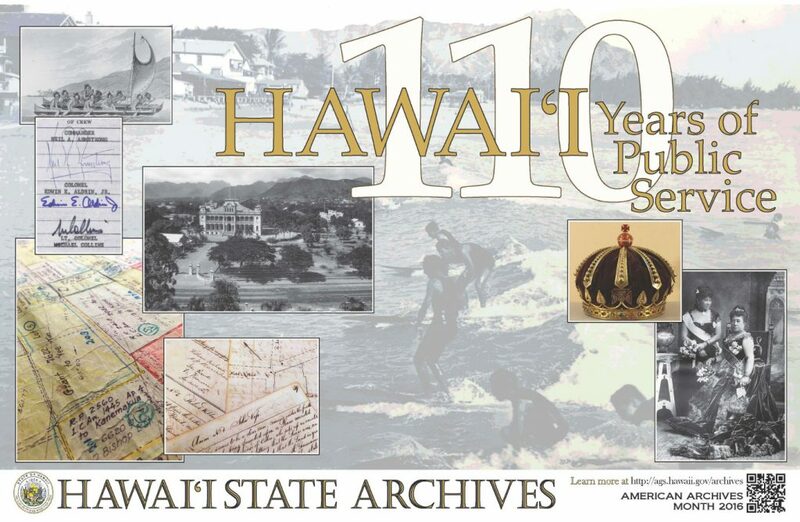 71, Bishop Museum Press, 1983, Honolulu, Hawaii.